One of the first things to take into consideration when choosing a tile for a tub or shower is the size. Larger tiles help make an area appear larger, but if you only have a 3’ wall a 20x20 tile will be too large. It is best to find the balance between the size of the tile and the size of the wall being covered. If you choose a decorative pattern for your tile, consider where your plumbing valves will end up. You don’t want a body spray to end up right in the middle of your decorative accent! If you choose a large format wall tile for your shower, you will need a coordinating tile for the shower floors that is small enough to be able to make the pitch on the shower floor. 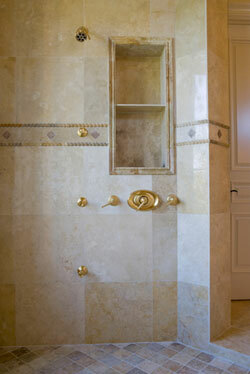 Typically, 4x4, 6x6 or mosaic tiles work best, depending on the size of the shower. If you are implementing a design element into a shower or tub/shower that you want to feature, consider that a clear frameless shower door will show off that accent the most and a shower curtain will hide it the most. Choosing to mix different tiles to create a pattern in encouraged, but be careful about mixing tiles with different thicknesses. Check with your tile designer or tile setter to see if your choices will work together for a smooth installation. Run the tile all the way up to the ceiling or stop around 8’ above the finished floor height. Finishing the tile – be sure to find out if the tile you select has a coordinating bullnose to finish off the edges of the last piece of tile. For a tub/shower you will have the choice to stop the bullnose or finishing element at the top of the tub or continue running it to the floor. Consider if your tile choice looks better with small or larger grout lines. If you have a large enough wall, add a feature like a decorative picture frame. This can be created with a listello as the frame and it gives you the option of the choices listed above to accent the interior. 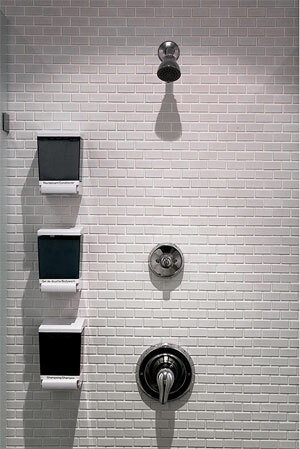 Some shower drains are offered in round or square shapes and a variety of colors that can be matched or coordinated to your shower valve colors. 1001 S Platte River Dr.